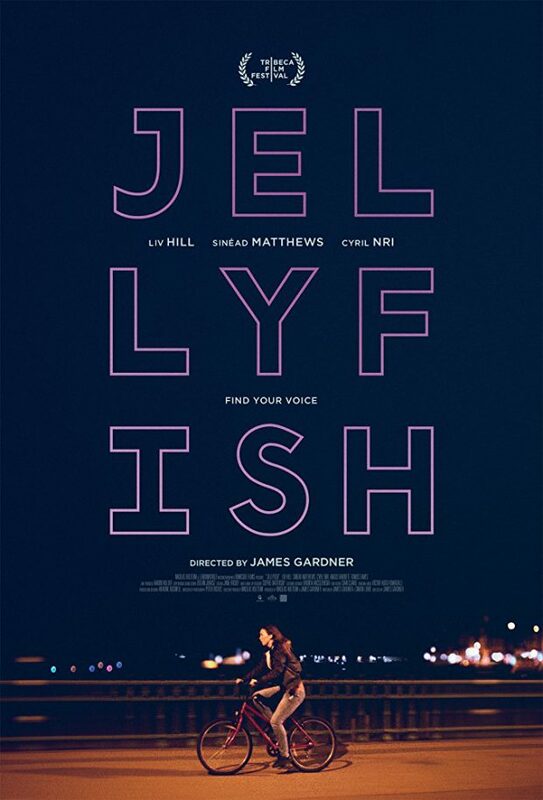 A young girl feels compelled to take responsibility for taking care of her family when her mother fails to be up to the challenge in James Gardner’s Jellyfish. Sarah Taylor (Liv Hill) doesn’t have a great life. The entire film focuses on Sarah as our eyes into the world that she lives in and it makes for a fascinating character study encouraging the viewer to be fully immersed in the daily struggle that Sarah deals with in order to simply exist. Her life is made up of three main elements; her family life, school life and work life. Her family is consistently below that poverty line and her mother Karen (Sinead Matthews) suffers from some sort of disorder that prevents her from being an effective guardian which means that Sarah has to step up to the challenge of being the mother figure for her young siblings who are too young to realise how bleak their lives are. In the absence of a strong mother or father figure she has to be both and has a lot of responsibility thrust on her. Her circumstances have made her strong with an ability to take care of herself that is far beyond her years. It’s the classic example of life forcing someone to grow up before they should and being denied some of the good things that life might bring. Her circumstances are ably contrasted by brief appearances of others her own age at school who are living well at least as far as she’s concerned. She isn’t well liked though she doesn’t seem interested in making friends either. It comes across that she has walled herself off from the rest of the world because everything has to be focused on caring for her family. Outside of school she has a job in an amusement arcade where she makes extra money servicing creepy old men on the side and has to deal with a condescending boss who makes her feel guilty for being unable to do shifts. This helps show that Sarah does whatever she feels is necessary to ensure that her family are provided for even if it means degrading herself by accepting money in exchange for servicing the older men that hang around the arcade looking for her specific talents. These three elements make up a really strong foundation that enables Sarah’s story to be told. From there the narrative delves into what difficulties come in each part of her life. At home she has to deal with being unable to afford electricity meaning that it’s difficult to feed her siblings, at school she can’t focus on actually deciding what her future might bring because nothing in her life is about her and her work is very difficult to balance with the other two elements so a lot of the film is spent showing how these elements push against each other to make her existence even more difficult. This plays out in some really powerful and harrowing ways with some moments being viscerally shocking in a way that doesn’t feel contrived or gratuitous. It all sounds relentlessly bleak and it definitely is though the film isn’t devoid of hope. The only teacher we see at her school, Adam Hale (Cyril Nri) may not have the whole picture but he picks up on her constant stress levels and lack of overall direction. He is the closest thing she has to a friend in the entire film and tries to encourage her by way of tough love which eventually points her in the direction of stand up comedy as something she is good at and could act as an escape for her that gives her something to focus on outside of how difficult life is. Adam Hale is a good character -if a little over the top- because he acts as a sounding board for Liv not connected to her through a familial bond. He is the one person in her life that offers her some semblance of support and has no desire to take advantage of her. It’s a necessary relationship that I wanted to see more of. This is Sarah’s story and Liv Hill is more than up to the challenge of telling it. Her performance is incredible; it combines with really sharp writing to create a wonderfully nuanced character that the audience can invest in and really sypmathise with. She’s strong when she needs to be, vulnerable when needed and projects a strong sense of the world she lives in slowly beating her into submission. There’s never any doubt that her current situation is unsustainable and a large part of this film chronicles her heading towards that breaking point. Liv Hill is certainly a promising young talent who deserves to go onto great success considering her performance in this. The other characters mostly serve to enhance her particular story. Sarah’s relationship with her mother is interesting because she recognises how unfit a guardian she is but would rather shoulder the bulk of the responsibility than have the family torn apart. She goes to great lengths to make sure that doesn’t happen because it’s important to her that nobody tears apart the family unit as it. Karen is very much an unstable and unpredictable force in Sarah’s life and is arguably detrimental to the ongoing well-being of the family but Sarah is clearly motivated by fierce loyalty and couldn’t bear to be separated from her siblings. Sinead Matthews does an excellent job portraying the barely lucid Karen and contributes to the complicated dynamic wonderfully. Jellyfish falls down slightly in the stand up comedy angle. The intention was to have Sarah find something in life that she is good at and can use to escape the weight of responsibility she feels elsewhere but it doesn’t slot into the overall plot as naturally as it could. Her love of comedy is something that comes up periodically throughout the narrative before paying off at the end but I never quite felt the connection to it that the film wanted me to. It doesn’t take away from the excellent character story but as elements go it needed a bit more work in order to feel like a natural extension of both the plot and Sarah’s character. Perhaps if she had spent more time honing her comedic skills as the film went on it would have been stronger. A powerful character study with a brilliantly nuanced central character wonderfully portrayed by a talented actor. The film does a great job building Sarah’s world and showing where her major conflicts come from before having the different parts of her live push together in really interesting ways. There are some really shocking moments throughout that don’t feel gratuitous and the constant struggle Sarah has with the weight of her responsibility is fascinating to watch. The stand up comedy aspect of the film could have been more strongly connected to the overall narrative though the intention of that area of interest was clear. It doesn’t quite gel with everything else as naturally as it could of though it also doesn’t take away from the excellent character story.